So what is the current ROI for solar in Michigan, one of the cloudiest places in the nation. 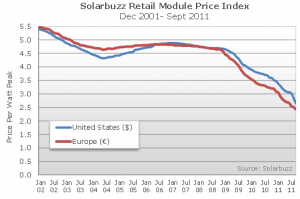 Solarbuzz ran an article a couple of weeks ago about global solar panel prices, and shows that today there are many panels for under $3.00/watt and you can buy some panels for as low as $2.50/watt. Michigan gets about 4 hours of peak sun per day. A theoretical 1-watt panel would generate 4 watt-hours per day, or 0.004 KWH per day. If I could sell or offset buying traditional power at $0.12 per KWH, that 1-watt panels would make (0.004*0.12) $0.0005 per day. 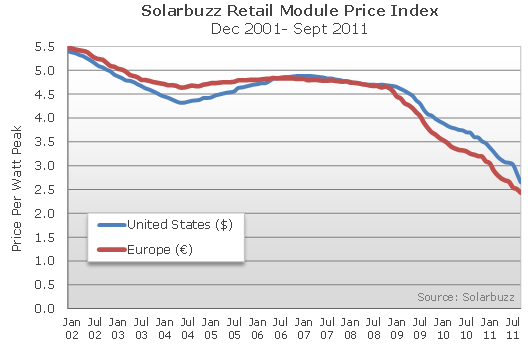 A solar panel that cost $3.00/watt would take (3.00/0.0005/365) ~17 years to break even. For $2.50/watt the payback period is ~14 years. These numbers get even better if you add inflation to the cost of traditional power for the 30 year life time of the typical solar installation. You can also add in the current 30% federal tax credit which is still in effect. This gets the payback period to about 10 years or better. While still longer then most people want, it is a positive ROI and if it pays for itself in 10 years, that’s 20 years of free power. Sounds like a good deal to me. The designer of SolarYpsi, Nik Estep, has added a new feature to the “installation” page. At the bottom of that page there is a link to compare sites. Clicking on that link will bring you to a new page with the all the solar curves on one graph. 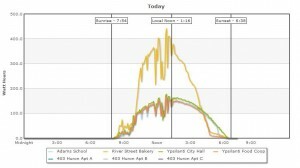 In the graph you can see that the Bakery generates more than twice as much power as the other sites. This is because it’s a 6KW systems where as the others are all around 2.4KW. You can see that it was cloudy in the morning and sunny in the afternoon. The Bakery’s power drops off faster than normal because it starts to get shaded from some tress. 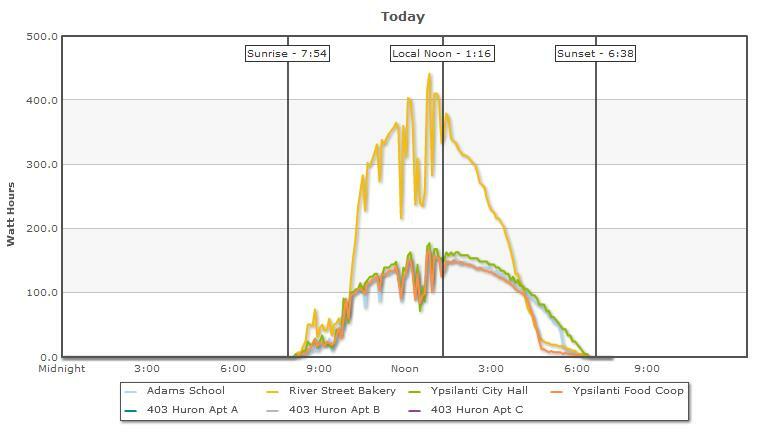 You can see that with the Ypsi Food Coop panels too at around 4:30pm in the afternoon. You can also see that Adams School’s power get’s clipped a little in the very late afternoon. City Hall is very high and has no shading issue, so the parabolic curve is smooth all the way to sun set. Note that this clipping is worse in the winter, since the sun is lower in the sky. It will be interesting to look at this comparison graph again next summer. Click on the link and play around with the graphs for different days or weeks. If you click on the names in the legend you can turn individual curves on and off. Yes, we need to get over to the Bakery and Ypsi Food Coop and trim some trees. Well by now I’m guessing everyone has already seen the SolarYpsi video that Google made. As of Oct 8th it has over 125,000 views. This video has also caused a ton of traffic on the SolarYpsi.org website. We were consuming the majority of the processing power on the server so we shut it off for a while. The traffic hasn’t tailed off yet, so last Friday we moved to a new and faster server. Many thanks to HDL.com for hosting and putting up with us and to Nik Estep who straighten out the website code after the move. As of Saturday night the website is mostly back together and I’ve been adding more content. Sorry for the outage, and let me know if you see anything not working correctly.